Doc takes a call just a few minutes before leaving for the soiree. When the PMP staff first learned that frequent contributor Dr. Gerry “Doc” Wegner, BCE, was being thrown a retirement party by the staff of Varment Guard Environmental Services, we knew we wanted in. Their Columbus, Ohio headquarters are just down I-71 from our own Cleveland digs, and Doc has been such a great resource and friend to the magazine. I was elected the official PMP delegate, since I was also able to ride along with two of their outstanding staffers — Commercial Service Manager/Safety Director Adam Warrix and Quality Assurance Manager Jeff East — for our upcoming June cover story. We signed the card, wrapped the gift (an Ohio State University neon clock to go in the “Buckeyes” guest room of the Florida home of Doc and his wife, Debbie) and I was on my way. 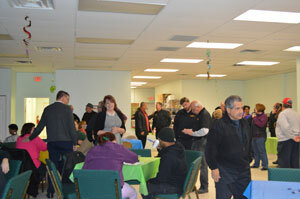 Good food, fun and fellowship at Doc’s reception. The morning was all business, since I was riding with Adam and then Jeff to their accounts. But once I came back at lunchtime, Adam joined Mark Goodman, Doc’s successor as staff entomologist, trainer and technical director, in wearing a vintage uniform Doc unearthed as he was packing up his office. That was just the start of the fun that spilled over to the church where the Vaives and the Wegners attend, Everyday People Ministries, hosted the reception. Doc joined Varment Guard in 1985, two years after Jim Vaive and Michael Moore founded the firm with $25 and a pickup truck. Today, Jim serves as president/co-owner, with his wife, Sandy, John Livingston and Scott Steckel serving as co-owners. 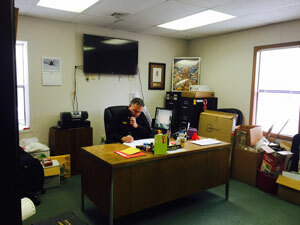 Doc brought to Varment Guard several years of experience in the pest control field, and in 1987 also became a co-owner. In 2012, however, in planning for his retirement, Doc offered his ownership shares back to the company. Doc and Debbie are leaving their Ohio home in good hands (their son, David) while they transition to a new life in Florida. He hopes to stay in touch with the industry, however, speaking, writing, taking insect photos and teaching. We hope so, too. Congrats, Doc!